I combined two of my favorite soups into one mega soup that’s perfect for fall. 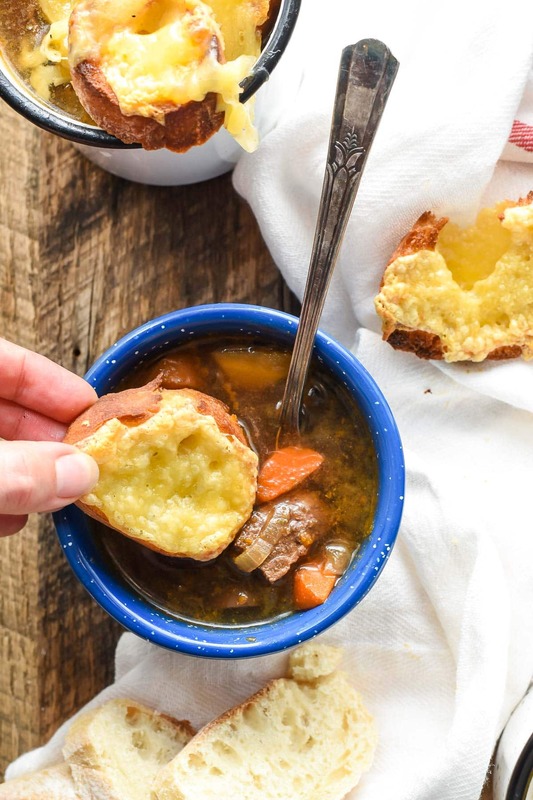 This Slow Cooker French Onion Beef Stew will warm up your home and your belly. I’ve gotten so used to pulling on a T-shirt and shorts that I’ve lost all ability to layer. Now suddenly I’m expected to know how to match a cardigan to a T-shirt and also work a scarf into the mix like I’m a regular Zooey Dechanel. What treachery is this? Oh, and don’t get me started on socks and shoes. My sock drawer is a black hole of frustration. I can’t remember which socks are boot socks and which socks are dress socks, and is it okay to wear black socks with a brown belt or not?? Sigh. If anyone can contact the Chip and Jo of the fashion world, send them my way. I have a job for them. While I might feel out of sorts in my closet this time of year, I feel right at home in the kitchen. Fall foods are my jam. Crock pot roasts, cozy Italian sausage soups, maple roasted sweet potatoes, apple tarts….I could go on, but you get the idea. Fall is the kitchen equivalent of my kindred spirit. It’s comforting and familiar, like slipping into your favorite soft flannel shirt (no layering required). It’s during this season I look to my crock pot to deliver warm, hearty soups, tender meats, and a smell that wraps you up like a blanket the moment you walk in the door. 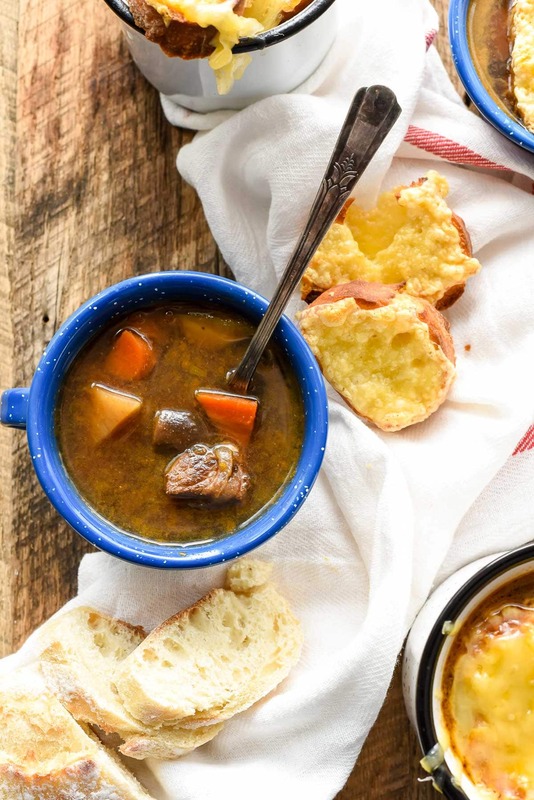 And that’s exactly what you’ll get with this Slow Cooker French Onion Beef Stew. 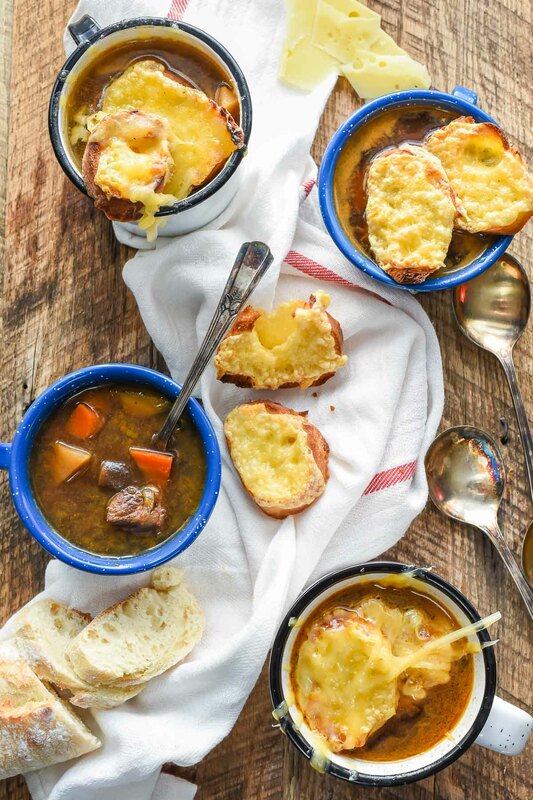 I took two fall favorites–French Onion Soup and Beef Stew–and combined them into one extraordinary meal. All the usual suspects for beef stew are here–carrots, parsnips, mushrooms, and tender hunks of stew beef all swimming in a thyme infused beef broth. 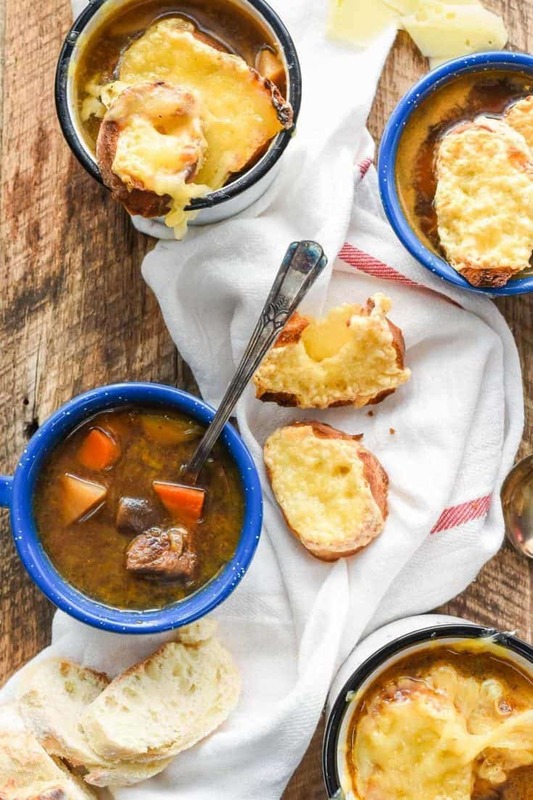 But this stew also benefits from traditional elements of French Onion Soup–rich and sweet caramelized onions, a hint of sherry, and a good ol’ smothering of toasted bread and Gruyere cheese. This combo had my hubby swooning (I mean, shouldn’t all beef stews have a layer of gooey melted cheese on top??). It does require a little more prep work than most of my crock pot meals, thanks to the caramelized onions. While the caramelization process does take some time, it requires very little hands on attention, and is well worth it for the flavor it delivers. Browning the beef will also give the stew a more robust flavor–the flavor lives in all those brown bits! My family always appreciates a good beef stew, and I’m always happy to provide them with a hearty meal that also delivers 10 essential nutrients and half the recommended protein for the day. I love crafting beef recipes for my family and readers while also supporting the 17,000 beef farming families right here in Ohio. I’ve had the pleasure of meeting a few of these farmers, and their commitment to caring for their animals and providing consumers with safe and healthy beef is both admirable and inspiring. This Slow Cooker French Onion Beef Stew will definitely be appearing on our dinner tables again and again throughout the fall and winter. I hope your family will enjoy it as much as we did. 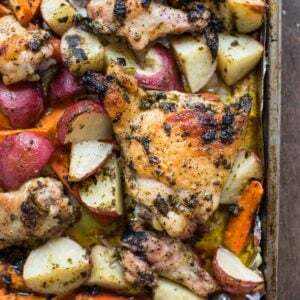 This is definitely a gathering stew, so grab your friends and invite them to the table as well. They’ll be greeted by a smell that feels more like a hug, and a dinner that will warm them from the inside out. 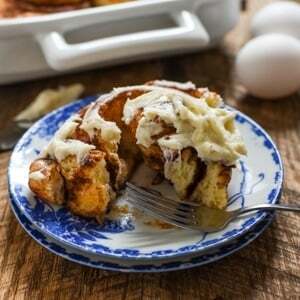 If you’re looking for more awesome crock pot recipes like this, make sure to check out my collection of The Best Slow Cooker Recipes! To caramelize the onions, melt the butter in a large skillet over low heat. Add the onions and toss with the sugar and salt. Allow to cook, stirring every 8-10 minutes, for about 40 minutes, or until onions are a uniform golden brown. Add the garlic and stir until fragrant. Place the onions in the slow cooker. Turn the heat up to high and add the beef pieces, searing for a minute or two on each side. Deglaze the pan with the sherry, scraping up any browned bits with a spatula, then pour the mixture into the slow cooker. Add the other vegetables, beef broth, bay leaf, and thyme to the slow cooker and cook on low for 8 hours or on high for 4 hours. If you can't find prepackaged stew beef, feel free to substitute with chuck roast or pot roast sliced into chunks. This recipe was developed in partnership with the Ohio Beef Council. To learn more about them, or discover new ways to cook with beef, visit them on Facebook, Twitter, YouTube and Instagram. Haha I am totally the same way! It was 40 when I left my house, but will be 70 later… How am I supposed to handle that?? 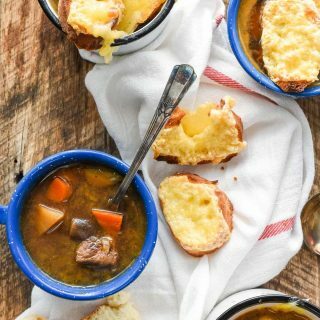 I LOVE the idea of this stew- I’m a hugeeee fan of french onion soup and love that you’re marrying it to beef stew here! !